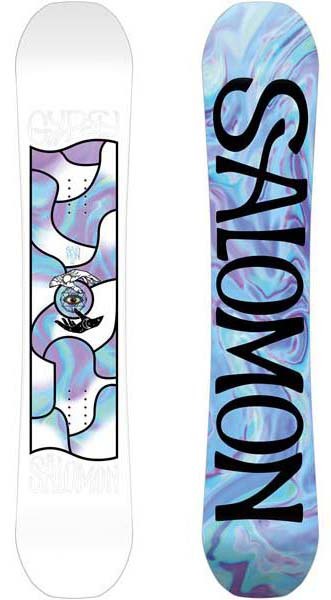 The Salomon Gypsy snowboard is a lively women’s specific freestyle deck that is a very damp ride with great pop and speed. It’s playful, responsive, and thrives most in the environment it was meant for, the park. Fun to jump, fun to jib, and can even hang in the pipe. Although the Gypsy thrives in the environment it was meant for it seems to be a little jumpy in uneven terrain, it’s like it can’t decide which way to go and won’t hold a consist line. But because it is such an agile deck you are able to work your way through it. Conditions: Powder, medium soft groomers and off-piste, hard snow. Approximate Weight: Feels normal to light underfoot. Flex/Buttering: It has a medium flex with rocker in the tip and tail so it is easy to butter and play around on. 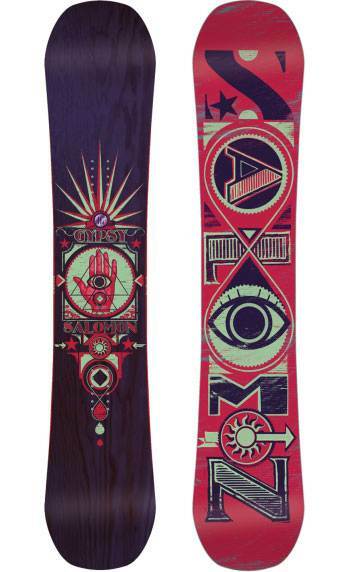 Edge Hold: The Gypsy has Salomon’s Quadralizer. (which is 4 straight lines around the sidecut that helps for much better edge hold than a normal round sidecut) This gives you a consistent edge hold that is still smooth while turning and carving. On Snow Feel: The Gypsy is a very stable ride and very damp. The only situation where I didn’t love it was when the snow was choppy or a little bumpy. Turn Initiation: Very fun and easy to spring back and forth into turns. Turning Experience: The Gypsy has a great personality on snow, it is fun to turn in almost all situations aside from super choppy conditions, and is very easy to make any size/kind of turn. Carving: It carves well and without a lot of effort. The camber near your feet help to hold a solid line while on edge and it has enough shape to spring you into the next turn. Speed: With the combo of the dampness of the deck along with the stability and sintered base this board rides fast and stable. Uneven Terrain: This is one of the categories where the Gypsy doesn’t shine. When riding through choppy or bumpy terrain it seemed that the board couldn’t decide which direction to bounce back and it couldn’t hold a consistent line. You can survive but it isn’t a super smooth ride. 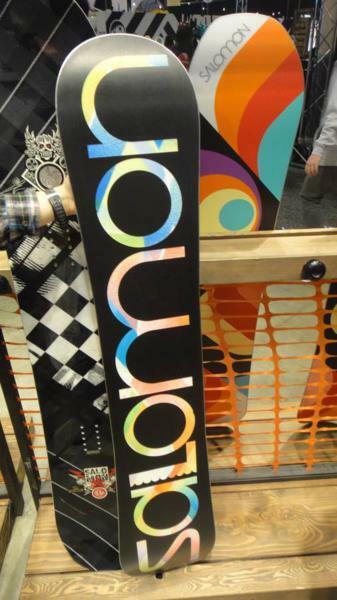 Powder: Rides ok in powder, like any true twin park board would ride, but it does have a little rocker in the nose to help you out if you run into some powder in between your park laps. Switch: Has the great true twin feel when riding switch. Jibbing: Great jibber with the flat camber in between the feet you feel very stable on boxes, and you have the camber underfoot as well that will help lock into rails, along with having a great pop to get onto features and being a very maneuverable snowboard the Gypsy is fun to jib. Pipe: Although I usually prefer more camber in the pipe, this board is fun here as well. I think the Quadralizer helps here as well so you can hold a more solid line throughout the pipe. 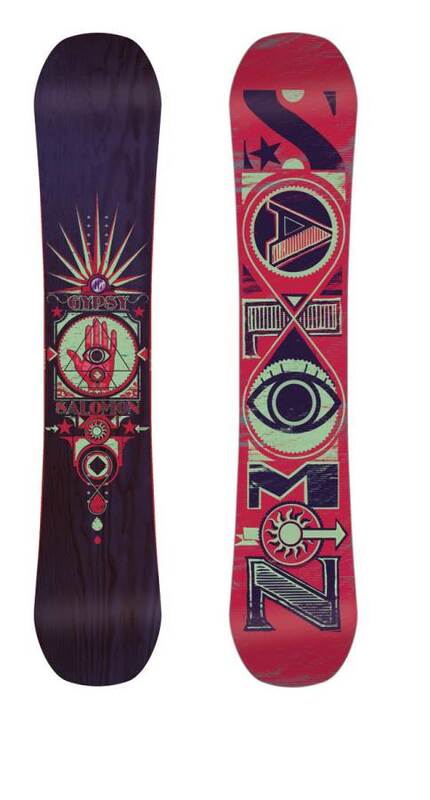 Overall the Salomon Gypsy is a very fun freestyle deck that also does well in a lot of other situations. It’s creative and smooth almost everywhere except for uneven terrain. But definitely thrives in any type of park situation. 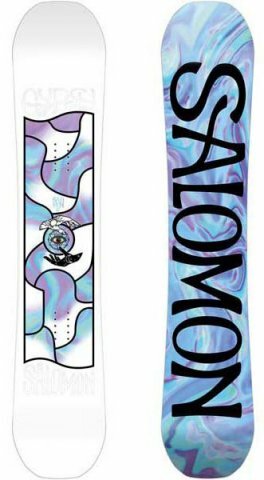 The Salomon Gypsy is a pretty lively but still buttery playful hybrid camber freestyle to mountain freestyle board that’s been in their line for a while. We have ridden this board year over year but here is Steph’s take this year. The Salomon Gypsy changed up the camber profile for 2013 and continued on in 2014 making it hybrid camber instead of Flat to Rocker and now it’s quite a different ride. 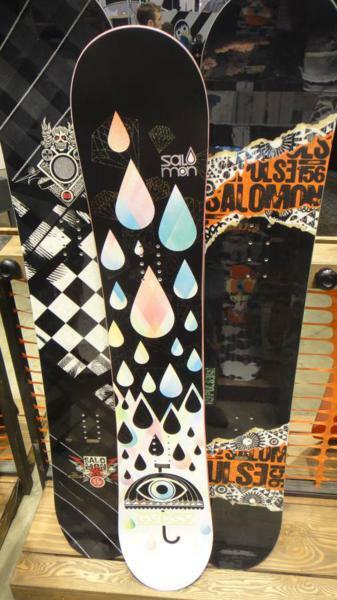 Both versions were a lot of fun but the new Hybrid camber edges out the old one due to the improved pop, carving and better all mountain freestyle feel. It also has a bit of early rise rocker to make it a bit more forgiving in the tip/tail. 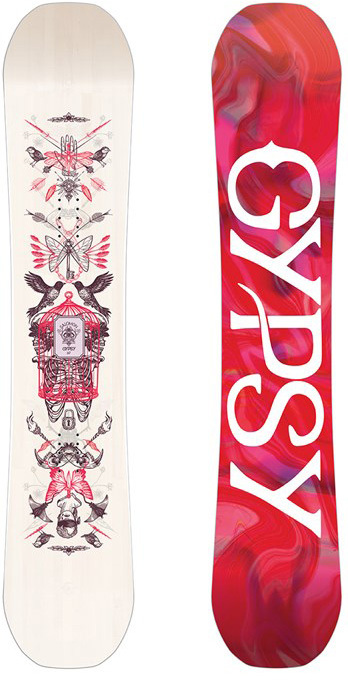 On Snow Feel: The Gypsy has a stronger ride to it this year compared to its previous flat to rocker profile. It’s going to be stable between the feet like camber but forgiving like rocker. 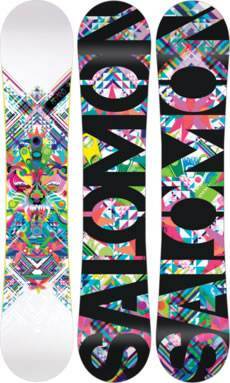 It’s great for riding the mountain regular or switch and great in the park. It will appeal to an all mountain freestyle rider that wants to keep their stance centered and treat the mountain like a park. Turn Initiation- It’s an easy board to turn. It’s quick and predictable but not super quick. You can make tight turns in the trees or down a steep chute or also make wider turns. Skidded Turns- A lot easier than camber for sure and it’s a good board for those who skid their turns or are working towards making really good turns or those that turn very well. Carving- The Gypsy can it carve much better now. . You can really lay into a tun and receive more spring out of it now compared to the old rocker Gypsy. 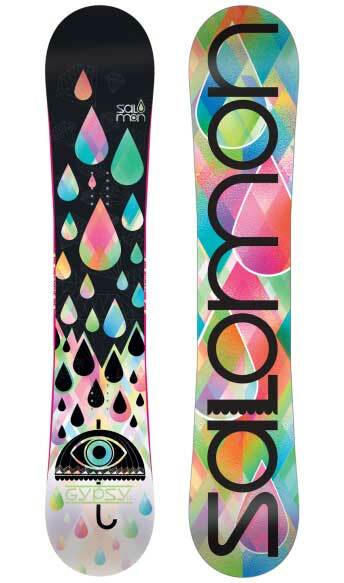 Powder: The old rocker Gypsy is better here but the rocker in the tip/tail still does well for a twin. 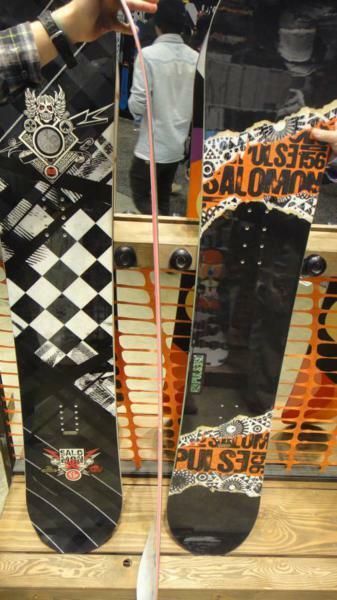 It’s not bad for a twin camber board and it’s very similar to some of the other hybrid camber boards we really like. Speed: The addition of some camber gave it a better all around feel when you pick up speed now. The base is similar but the feel is indescribably better. Still it’s not a bomber and its more for moderate to playful speed when it comes to mountain riding. For the park it’s all the speed you need. Uneven Snow- This is going to be not as good as many other twins out there. There is more pass through when you have to slow down and deal with bumpy or hard chunky snow. Approximate Weight- Same easy on the knee feel that the old Gypsy had. Flex: Still has that great flex that the old Gypsy had. The butter factor is still great when you get some weight on the nose and it really is fun to butter with. Jibbing– Just as good and maybe even a tad better if you like soft camber boards in the jib park. Pipe: The camber added to the good original side cut make the Gypsy a much better pipe board. It grips the pipe walls much better now and it’s got nice drive from wall to wall. Jumps: Before the old rocker model wasn’t lifeless but it wasn’t at the top of the pop game. The new Gypsy is much better than the old. It’s springy, fun to ollie and a great ride on a line of jumps. All in all we are much happier with the improvement in all around ride of the new Hybrid Camber Gypsy. It’s got a very do everything mountain freestyle kind of ride that our girls really liked. The Salomon Gypsy is one of those super fun boards that can do just about anything out there well and can live on either side of the park fence. Our only complaint is it should of received a different name. Groomers/Turning/Carving– The Gypsy is one of those boards you would think would be too washy and chattery to have a good time on groomers but we were surprised here. We expected playful but didn’t expect it’s ability to turn as well as it did. Neither of us were bombing but it was really fun to make a good turn or two and then look for something on the side of the run to jib or jump. It’s a fun ollie, make a few turns, butter, and medium speed kind of play around the mountain board. When making short quick turns the Gypsy had no problem getting from edge to edge quickly without feeling too sticky. When we opened up into a serious carve we expected a wash out a lot earlier than we thought. It held really well and was fun to make wide open turns on the hill. It was a lot more fun than we expected. 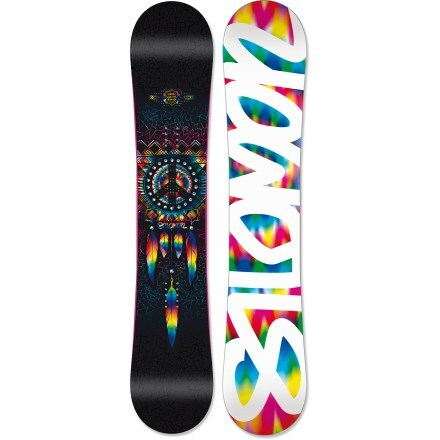 Powder: For a twin with a centered stance the Gypsy does a great job. It’s no super dynamic pow board but if you live in areas with light fluffy snow you might never want for more. If you live in areas with thick coastal deep storms that bury houses you will be wanting something more. Speed: It’s going to hold up pretty well at moderate speed and the base wasn’t super slow. It’s more than you need for most park approaches and about average on the mountain side. Weight– To us it felt pretty light and didn’t really bring the weight to our attention either way. Edge Hold: The Gypsy held an edge pretty well but didn’t’ blow minds like some did. The “equalizer” sidecut helps make the Gypsy hold an edge a lot better than it should but it stops a little short of magnetraction. We never felt like we needed more edge hold but didn’t feel like there was no limit to the Gypsy. Flex: The flex is medium but felt more soft on the hill. It’s soft but not soo soft that it’s limp. Switch: A true twin with flat/rocker like this makes it easier to rider switch for those that do it allot or want to learn. Rails/Jibbing: Pretty fun to lap the jib park with. 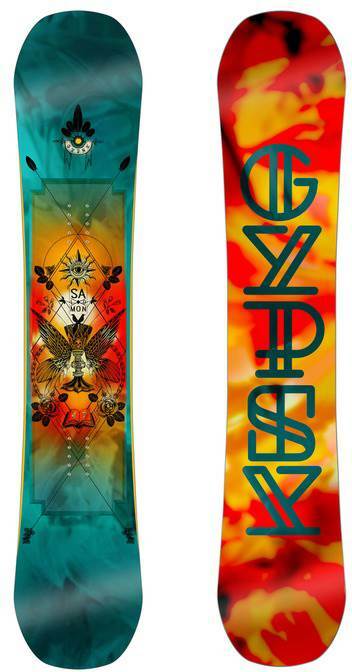 There are softer more jib friendly boards out there but the Gypsy is pretty fun. The flat between the feet makes it pretty easy to slide. Pipe: It doesn’t have that pipe wall magic but it’s pretty fun for a board of this shape. Jumps: When it comes to getting it up on your own…..in the air it doesn’t need jump Viagra but it might need a fluffer. What we mean is the board is not completely dead but compared to other boards out there it’s just not as springy. Still its very fun to lap the jump park or try something new off a smaller natural hit. We try to get as many images of the Salomon Gypsy, but forgive us if they're not all there.